That being said, I am wayy excited to check out the upcoming (Sept 25th) Banhart record, Smokey Rolls Down Thunder Canyon, in it’s entirety, as, so far, the teaser tracks and “Seahorse” video have been fantastic. 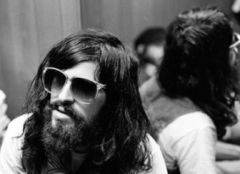 “Seahorse” is of particular interest, as during its almost ten minute frame it splices together what feel like four different, separate songs, beginning with the low-key “freak folk” Banhart is known for, and ending with a dead-on Jim Morrison rock & roll rave up. For reals. All sorts of guests are said to have been on hand during the recording of the LP, in California, including, surprisingly, Gael Garcî­a Bernal, and, not so surprisingly, original neo-hippie, Chis Robinson. With all this Devandra talk, I wanted to make sure and plug the pre-rocker Marc Bolan, who, not unlike Banhart, led a weirdo folk outfit, Tyrannosaurus Rex, prior to plugging his electric guitar into an amp with the late sixties re-configured T. Rex. As T. Rex’s legacy (rightfully) grows, Bolan’s previous psychedelic incarnation slips a little farther back in the story, which is a shame as Bolan’s Tolkienian inspired, pastoral, folk jams were not only good, they provided a blueprint for much of what has been considered ‘groundbreaking’ and ‘unique’ in the neo-folk genre here in the 21st century. 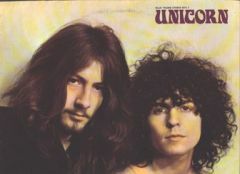 Here are two tracks off the reissued Tyrannosaurus Rex LP Unicorn. seahorse is completely and utterly awesome. I was glad to see the Swiffer at the end. I was wondering how they handled all the fallen beard hair in that house. Also spotted in the video: Elliot Roberts, their manager as well as Neil Young’s. This may sound off – but was that the actor Gael Garcia Bernal (Motorcycle Diaries, Science Of Sleep, Babel) maybe a quarter through the “Seahorse” video, just listening? We are in the presence of greatness…. Thanks for this. I can’t wait for the rest. My wife played Banhart for me the first time and I believe I said, “Is that some older Marc Bolan?” I still can’t listen to him without picturing Bolan playing. Thanks for the post. I’m with HL. I believe that Banhart can only sound fresh and inspired to people who aren’t already familiar with Bolan, who in Unicorn made an album that Banhart will never come within a mile of. I still have yet to hear a single Banhart song that sounds original to me–‘Seahorse’ just seems like a patchwork of imitiations. To those who hear something more, I’m glad you enjoy it. Fantastic! Anything that points people to Unicorn or A Beard of Stars deserves a pat on the back.